A strong upper ridge persists across the Arctic region and N Europe while upper low moves from the E Mediterranean into the Middle East. A deep trough / low is approaching the Iberian peninsula from the Atlantic while another low move north near Iceland with an intense surface cyclone. MDT risk has been issued for central and SSW Iceland with threat for extremely severe winds, locally in excess of 130 km/h. Peak gusts are expected across the higher terrain and could easily exceed 160-180 km/h! 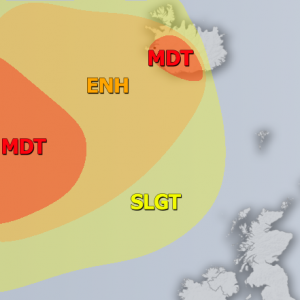 ENH / SLGT risks have been issued for areas surrounding the MDT risk across W/S Iceland with threat for severe to extremely severe, locally exceeding 110-120 km/h. ENH risk has been extended across SE Iceland where strong orographic rainfall will be ongoing, resulting in excessive rainfall (above 120 mm / 24h). ENH / SLGT risks have been issued for SE Turkey into the Middle East with threat for severe storms, capable of producing severe winds, large hail and torrential / excessive rainfall. Very intense wind shear will overlap with marginal to moderate instability, resulting in organized storms along the eastward moving front. 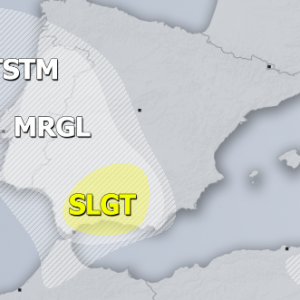 MRGL risk has been issued for NE Algeria into N Tunisia with isolated threat for severe storms, capable of producing severe winds and marginally large hail.